Brands often come under fire and receive negative PR attention through the usual channels like Facebook, Twitter, and Yelp. But what would your brand do if it was the recipient of huge national news dealing with fraud? While your company needs to react swiftly, you also need to have a plan to manage your message. Your team needs to leverage every marketing channel to ensure you combat the negative PR that will swamp your brand’s image. PPC is the perfect marketing channel to address negative information about your company. This is because PPC is an on-demand marketing solution that can help you position your message at the top of search engines. 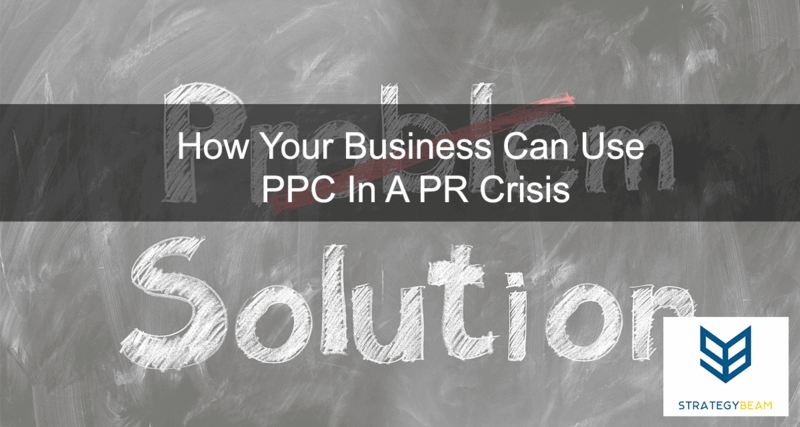 PR professionals should use PPC as part of their integrated strategy to ensure the long-term stability of your brand. We can look at the recent Wells Fargo scandal to see how your business can use the right PPC to overcome negative PR. In the wake of Well Fargo’s scandal involving fraudulent accounts set up by employees to hit their quotas, the company has taken drastic action to absorb the impact of the side effects to its brand. The company’s activities have covered various online channels from social media to email marketing and PPC advertising. Wells Fargo has adopted the message of customer care and working to regain trust by doing the right thing. Whether their intentions and reactions are enough is yet to be seen, but I can tell they are proactively managing their PPC campaigns to drive home the message of forgiveness and change. The scandal came to light in early September when misconduct was revealed to the Consumer Financial Protection Bureau (CFPB). Around the same time, we saw a significant jump in traffic to their website and ramped up their PPC campaign. Looking at an SEMRush traffic report, we know that Wells Fargo placed a lot of resources behind an effort to combat the PR nightmare what was to ensue. In the wake of Well Fargo’s scandal involving fraudulent accounts set up by employees to hit their quotas, the company has taken drastic action to absorb the impact of the side effects to its brand. Wells Fargo is getting blasted in the news and even on Capitol Hill by U.S. lawmakers who accuse the company managers of forcing employees to take illegal action to help inflate the numbers of the company. While Wells Fargo needs to take drastic action to prevent this type of occurrence in the future, they are using PPC as a way to control their message and alter their public image. I did some research into how Wells Fargo is implementing PPC to overcome their bad PR and wanted to share some of my findings here so you can apply them to your company if you run into a similar situation. Keywords are the lifeblood of online search because they identify the intent of your audience. Every time your customers go to Google or Bing, they ask specific questions through search queries based on their needs and purpose. If your business wants to overcome bad PR, then you need to control the information your audience sees when they search for your brand. While you can’t control what is published about you on social media and major news outlets, your business can use PPC as a quick way to set a particular message at the top of search results. I was curious about the keywords Wells Fargo is focusing on for their tailored PPC message. I used SEMRush and other professional research tools to reverse engineer specific PPC campaigns and isolate keywords employed by Wells Fargo to establish their customer-focused PPC messages. Wells Fargo targeted these keywords because they knew the interest and intent of customers searching for these terms. Wells Fargo chose to take control of their message by placing their paid ads at the top of search results. When your business is faced with a negative PR nightmare, your PR and marketing team should work together to create the perfect message. Since your business is in a struggle against the public opinion you need to use PPC to overcome any existing negative PR. Great PPC ads can help temper negative search terms concerning your brand during times of bad press. Bidding on specific terms with focused keywords can help you counter a message that could hurt your brand. Wells Fargo used specific keywords (listed above) and connected the keywords with a positive message in their PP campaign. The message uses Headers, Paths, and Descriptions to establish themselves as a trustworthy company looking for redemption. Site links give additional value to your PPC ads because they offer your brand the opportunity to showcase individual pages on your ads. In addition to providing links to your website landing pages, site links also increase the exposure and real estate your ads take up on the screen. 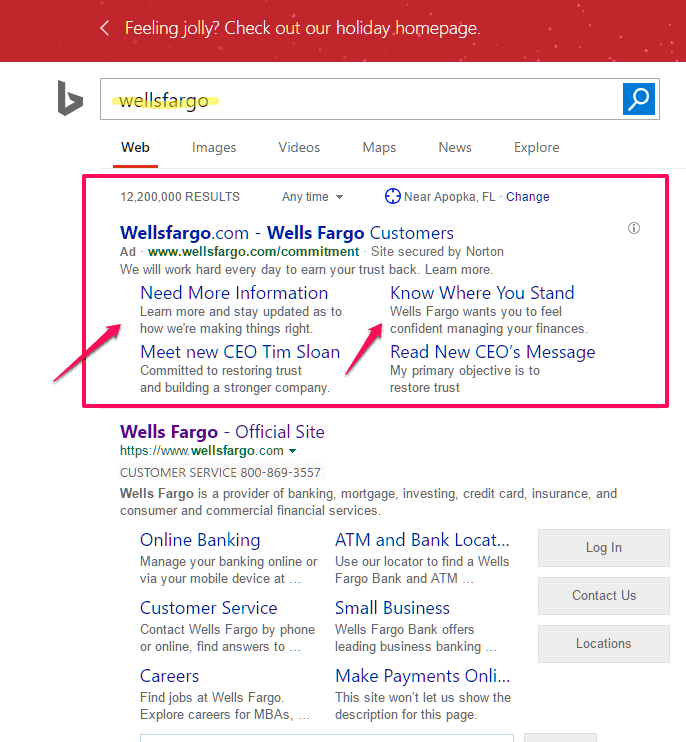 Wells Fargo is using similar ad copy in their Bing ads as they are in the Google campaigns. In the most recent turn of events, the scandal of Wells Fargo looks to be turning to Prudential Financial. The early news reports show that Prudential is accused of covering up fraudulent sales of life insurance policies through Wells Fargo. At the moment of writing this article, Prudential has not adjusted their PPC campaigns to address public perception of the recent news coverage. 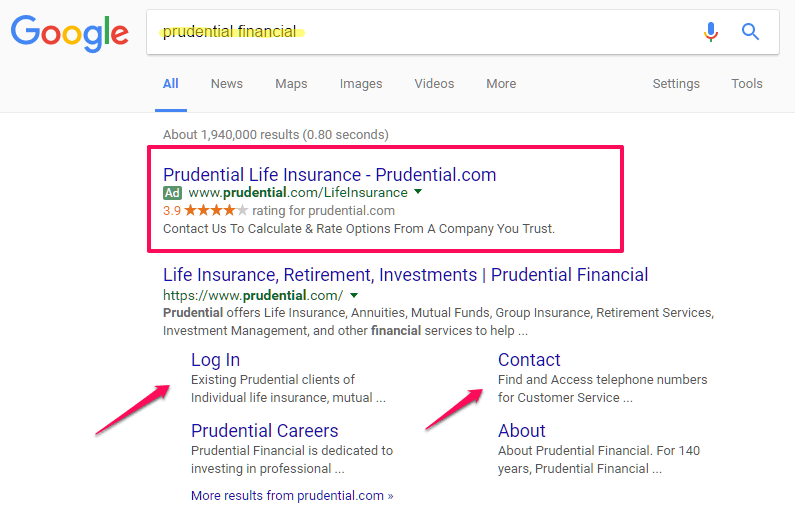 If Prudential wants to get ahead of the negative publicity, they will want to produce focused ad copy around targeted keywords. Prudential will need to take control of their message by following the online strategy of Wells Fargo to prevent the additional impact of their situation. Prudential should use Exact Match and Broad Modified Keywords to cover their public perceptions. They should focus on the keywords that news agencies are using to describe the situation and anticipate what interested customers will look for in Google and Bing. I am interested to see how Prudential reacts to the bad PR that is expected to ensue in the future. Contact me if your business wants to learn more about how you can position yourself in the market with PPC and other digital marketing strategies!